"Silver Linings Playbook" is simply one heart-warming film. One that not only presents a great and extremely fresh story but even greater performances by its director and its cast. Even with a sticky main topic as mental illness, the film finds a way to make the film funny without being offensive. And who knew a relationship between two people who struggle with mental disorders could eke out so much chemistry? 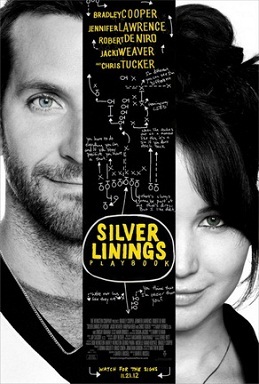 "Silver Linings Playbook" touched as like no other film we have watched recently. It's simply that good. Pat (Bradley Cooper) is released from a mental health facility into the care of his parents after eight months of treatment. Pat has a bipolar disorder in which he only found out when he beat up his wife's co-worker when they found them doing the deed. As Pat goes home, he soon learns that his wife, Nikki (Brea Bee), has moved away and his father, Pat Sr. (Robert De Niro) is out of work and resorting to bookmaking to earn money to start a restaurant. Pat wants to prove he has changed and determined to get his life and wife back but this is easier said than done as Nikki has a restraining order against him. The restraining order even prevents him to send a written letter to Nikki. Soon though, Pat meets Tiffany (Jennifer Lawrence), a recent widow and also one who has mental instability. Tiffany has direct contact with Nikki and she agrees to give Pat's letter to Nikki as long as Pat agrees to be her dance partner at a competition. As Pat hesitantly agrees, the two develop an understanding like no other and one that might solve their problems. What makes "Silver Linings Playbook" work is simply because of two things. First is the outstanding acting by its lead stars and second by its director, David Russell. There's no denying that this is the best performances coming from Bradley Cooper and Jennifer Lawrence. It is amazing to see how both leads' struggle with their illnesses come out so authentic. But even more than that, their chemistry together is jaw-dropping. Minus Bradley Cooper's struggles with dancing, this is one sensual and memorable performances from both - individually and as a couple. As for everything else, they just simply work. From Chris Tucker's supporting role to Pat's struggles with his one-of-a-kind family and friends, the film simply turns out to be perfect.